You know those classic desk toys, like the infinity momentum ball thing? Or the bird that constantly dips its head down? Throw those out the window kids, and take a look at this. 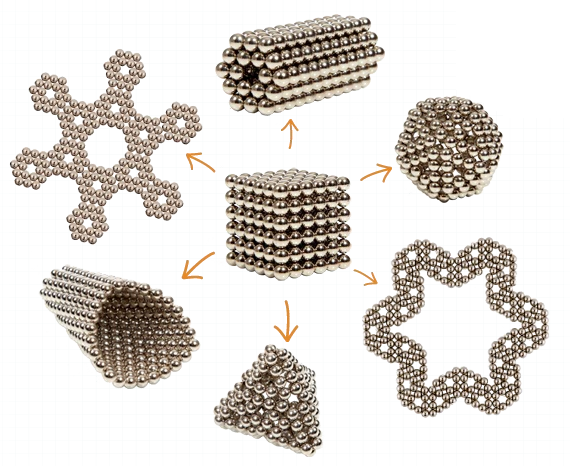 Presenting Buckyballs, the nerdiest, coolest desk distraction you can buy these days. They ship as a cube of 216 ‘magnetic earth’ balls which can be shaped, molded, torn apart, and snapped together in pretty much any shape you can imagine. Whether you’re into crafting snowflakes or building towers, these balls can keep your hands occupied and your head clear for hours. 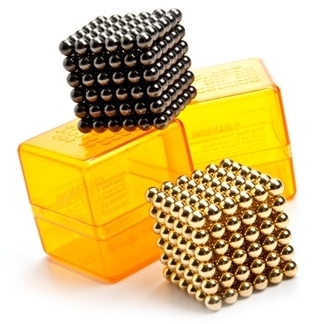 Buckyballs are available in four different shades – original pewter, sparkly silver, glimmering gold, and sleek black. And yes, the adjectives are my embellishments, when you consider these are actually a pretty gender-neutral plaything. Or you know, professional stress reliever. These things actually have legs…you don’t just have to let them rest on your desk. You can craft fridge magnets, pieces of jewellery, or a dining room centerpiece to get the conversation flowing at the next dinner party you attend. 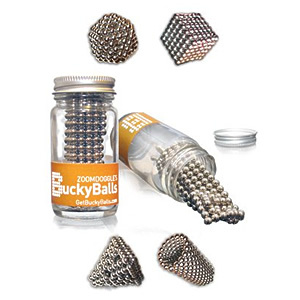 Buckyballs are available directly from the company’s website for $30 a set. Alternatively you can find them at your local Showcase (yeah, the ‘as-seen-on-tv’ store), which has 61 shops across Canada, or if you’re desperate to get your hands on a set, check out the website Puzzle Master Incorporated. These are a great choice for the friend that’s constantly harping about their job, or think ahead for Father’s Day in June. Also consider them a congrats for someone that gets hired onto a new gig and wants some flashiness to decor their desk right off the hop.